Welcome, true believ...wait, that's probably copyrighted. But welcome anyway. When last we were here, my current character, Spider-Man, had finally hit a run of bad luck. Things would only get worse. Our GM smiled at me as I sat down to the game table. One of those smiles a GM only gets when he's finally thought of some horrible fate for a character, or created a villain or situation he is particularly proud of. "I've finally made your Enemy. Took a long time, but it's ready", he said jovially. See, in GURPS, one of the main things that sets it apart from other systems is the Disadvantage section. The GM sets a point limit, and the players can then buy disadvantages for their character, gaining extra points for advantages (powers) and skills. In turn, your character is expected to live with these disadvantages, and the player is expected to roleplay them out. For example, there's a disadvantage known as Dread. Upon taking this disadvantage, you're to pick one random thing your character fears. Your character can now sense the thing he dreads whenever he is within 20ft, and must take action to get away from it if it comes within a yard. I once had a wizard who had a Dread of spoons. He absolutely refused to even so much as enter a tavern. A particularly mocking friend player had his character carry a spoon on his person at all times, so my character could never come close. Spider-Man's Disadvantage? Among others, was Enemy. Depending on how many points you wanted back for it, the enemy could be one or many people, weaker or even stronger than your character. I decided mine was stronger than me, and it would show up fairly often. The downside? The GM made the enemy himself. I had no idea what to expect. A Goblin of my very own? Some twisted take on Venom or Carnage? When Spidey left the hospital, he reconnected with his team. They, in the meantime, had finally tracked down some clue as to the people responsible for Silver Shadow's murder. The trail led us to an abandoned ship being used by a group with military connections we had actually come in contact with prior, and thought were the good guys ( one of our players was a robot who had been supplied by this very same group). Nevertheless, they attacked. And unleashed their new weapon, The Octobot. A massive eight-armed monstrosity of metal. Each arm equipped with a different sort of cannon. A flame thrower. A grenade launcher. Others that we never saw used. But, most importantly, a mind blast cannon with a direct link to my Spider Sense. We held our own for a good while. As Spider-Man and the Purple Lantern engaged the Octobot, Shepard and Kane Lee engaged wave after wave of henchmen coming from both the ship and on wave runners. Cement Man and a giant mutant creature both took a tumble and fought underwater, sinking to the bottom. One lucky shot was all it took. Purple Lantern was busy dodging blasts from the flame thrower, when Spider-Man was hit by the mind blast cannon. He dropped unconscious, screaming and convulsing. Another arm scooped up the collapsed hero, and dragged him into the metal beast. Purple Lantern tried, but was unable to stop the Octobot's escape, as it dove into the water and was gone. Is Spider-Man dead? Unknown. All we know is he is now in the hands of those who had betrayed us. The rest of the party was able to continue on, finding the clue we had been seeking, a link to a scientist named Dr Stockman. They headed to his last known location after some rest and recuperation. Meanwhile, I needed a new character. Inspired by some artwork I saw featured on Kotaku not long ago, I decided to make a ninja turtle. 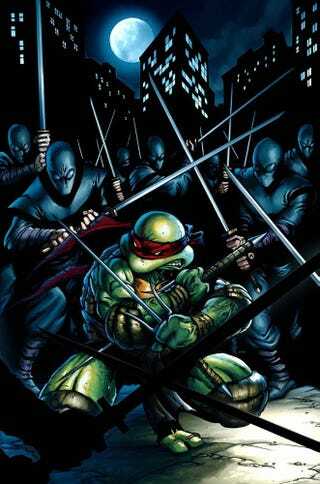 I chose Raph, as he has always been my favorite. His brothers and master have been killed by the Grater. And Raph has suffered severe mental trauma due to it. Alone and on the run, he is consumed with revenge on the Claw clan and Grater himself. His only lead, beaten out of a low ranking criminal in Paragon City, leads him towards a Dr Stockman. And on a collision course with the team.